Our makerspace got a donation of a bunch of Galileo gen2 boards from Intel (image from Mwilde2 on Wikimedia commons). The Galileo line has been discontinued, so there's no support and no community, but in theory they're fairly interesting boards. You can use a Galileo in two ways: you can treat it like an Arduino, after using the Arduino IDE to download a Galileo hardware definition since they're not Atmega chips. They even have Arduino-format headers so you can plug in an Arduino shield. That works okay (once you figure out that you need to download the Galileo v2 hardware definitions, not the regular Galileo). But they run Linux under the hood, so you can also use them as a single-board Linux computer. The first question is how to talk to the board. The documentation is terrible, and web searches aren't much help because these boards were never terribly popular. Worse, the v1 boards seem to have been more widely adopted than the v2 boards, so a lot of what you find on the web doesn't apply to v2. 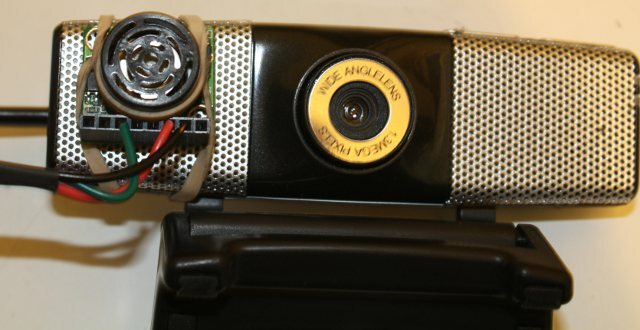 For instance, the v1 required a special serial cable that used a headphone jack as its connector. Some of the Intel documentation talks about how you can load a special Arduino sketch that then disables the Arduino bootloader and instead lets you use the USB cable as a serial monitor. That made me nervous: once you load that sketch, Arduino mode no longer works until you run a command on Linux to start it up again. So if the sketch doesn't work, you may have no way to talk to the Galileo. Given the state of the documentation I'd already struggled with for Arduino mode, it didn't sound like a good gamble. I thought a real serial cable sounded like a better option. Powered up the Galileo and sure enough, I got boot messages and was able to log in as root with no password. It annoyingly forces orange text on a black background, making it especially hard to read on a light-background terminal, but hey, it's a start. Later I tried a Raspberry Pi serial cable, with just RX (green), TX (white) and Gnd (black) -- don't use the red VCC wire since the Galileo is already getting power from its own power brick -- and that worked too. The Galileo doesn't actually need CTS or RTS. So that's good: two easy ways to talk to the board without buying specialized hardware. Funny they didn't bother to mention it in the docs. Once connected, how do you do anything? Most of the Intel tutorials on Linux are useless, devoting most of their space to things like how to run Putty on Windows and no space at all to how to talk to pins. But I finally found a discussion thread with a Python example for Galileo. That's not immediately helpful since the built-in Linux doesn't have python installed (nor gcc, natch). Fortunately, the Python example used files in /sys rather than a dedicated Python library; we can access /sys files just as well from the shell. All the Galileo documentation is emphatic that you should download a Linux distro and burn it to an SD card rather than using the Yocto that comes preinstalled. The preinstalled Linux apparently has no persistent storage, so not only does it not save your Linux programs, it doesn't even remember the current Arduino sketch. And it has no programming languages and only a rudimentary busybox shell. So finding and downloading a Linux distro was the next step. Unfortunately, that mostly led to dead ends. All the official Intel docs describe different download filenames, and they all point to generic download pages that no longer include any of the filenames mentioned. Apparently Intel changed the name for its Galileo images frequently and never updated its documentation. From the size, I suspect those are all Linux images. But what are they and how do they differ? Do any of them still have working repositories? Which ones come with Python, with gcc, with GPIO support, with useful development libraries? Do any of them get security updates? As far as I can tell, the only way to tell is to download each image, burn it to a card, boot from it, then explore the filesystem trying to figure out what distro it is and how to try updating it. But by this time I'd wasted three hours and gotten no further than the shell commands to blink a single LED, and I ran out of enthusiasm. I mean, I could spend five more hours on this, try several of the Linux images, and see which one works best. Or I could spend $10 on a Raspberry Pi Zero W that has abundant documentation, libraries, books, and community howtos. Plus wi-fi, bluetooth and HDMI, none of which the Galileo has. It's a fairly cool option to have. Maybe one of these days, I'll pick one of the many available distros and try it. Playing with the ATtiny85 I was struck by how simple the circuit was. Sure, I'd made a homemade Arduino on a breadboard; but with the crystal and all the extra capacitors and resistors it ends up seeming like a lot of parts and wires. If an ATtiny can use a built-in clock and not need all those extra parts, couldn't I use an Atmega328 the same way? Why, yes, as it turns out. But there are a few tricks. Wiring a bare Atmega chip is easy. You'll want to keep a good pinout diagram handy, like this Arduino ATmega328 Pinout from HobbyTronics. For the initial wiring, all you need is two power and two ground lines, the pins marked - and +, plus a pullup resistor on RST (something large, like 10kΩ). The excellent tutorial From Arduino to a Microcontroller on a Breadboard is a good guide if you need additional details: the third section shows a circuit without external clock. 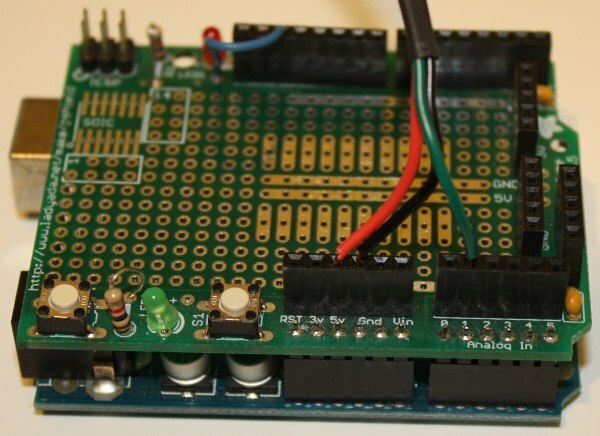 Add an LED and resistor on pin 13 (atmega pin 19, called SCK) so you can test it using a blink program. Now you need to set up the software. Now your hardware definition should be ready to go. 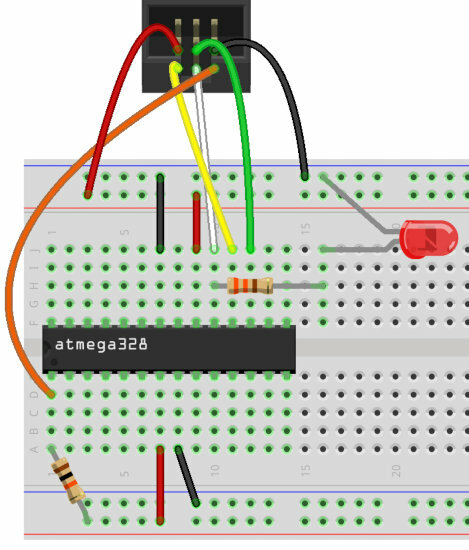 To check, fire up the IDE and look in Tools->Board for ATmega328 on a breadboard (8 MHz internal clock). 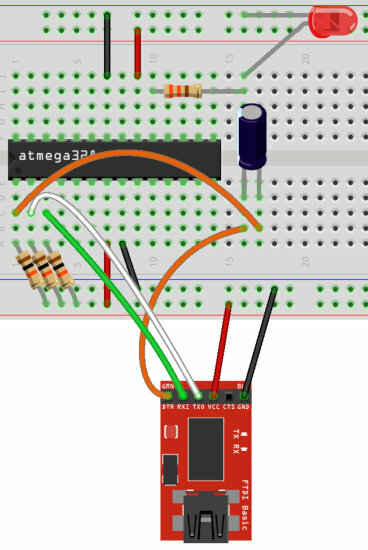 Or if you use Arduino-mk, run ALTERNATE_CORE=breadboard make show_boards and make sure it lists atmega328bb ATmega328 on a breadboard (8 MHz internal clock). The next trick is that an Atmega chip programmed with the Arduino bootloader is also fused to use an external, 16MHz clock. If you wire it to use its internal 8MHz clock, you won't be able to talk to it with either an ISP or FTDI. You'll definitely run into this if you pull the CPU out of an Arduino. But even if you buy new chips you may see it: many Atmega328s come pre-programmed with the Arduino bootloader. After all, that's what most people want. The easiest way to reprogram the fuses is to use the hardware definition you just installed to burn a new bootloader, which resets the fuse settings at the same time. So you need an In-System Programmer, or ISP. You can use an Arduino as an ISP, but I'm told that this tends to be flaky and isn't recommended. After I had problems using an Arduino I ordered a cheap USBtinyUSP, which works fine. Plug your ISP into the Arduino's ISP header: on an Uno, that's the header labeled ICSP at the end of the chip farthest away from the USB plug. It's a six-pin connector (2x3), it's easy to plug in backward and you can't depend on either the Arduino's header or the ISP's cable being labeled as to direction; if in doubt, use a multimeter in continuity mode to see which pin is ground on each side, then make sure those pins match. Once you're sure, mark your connector somehow so you'll know next time. In the Arduino IDE, set Tools->Board to ATmega328 on a breadboard (8 MHz internal clock), set Programmer to whatever ISP you're using. then run Tools->Burn Bootloader. Once you're wired, you should be able to program it either with an FTDI board or an ISP, as I discussed in homemade Arduino, Part 1. You should be able to use your minimal Atmega328 to run anything you can run on a normal Arduino (albeit at half the clock speed). I plan to make a little board with a ZIF socket and connectors for both the USBtinyISP and the FTDI Friend so I don't have to plug in all those wires again each time. 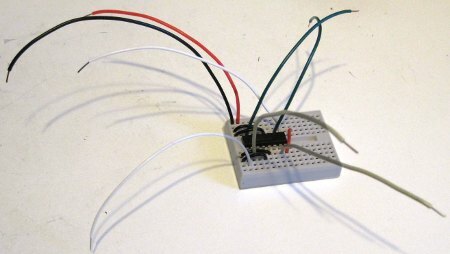 There are lots of tutorials around for building an Arduino on a breadboard, using an Atmega328 (or the older 168) chip, a crystal, a few capacitors and resistors and a power supply. 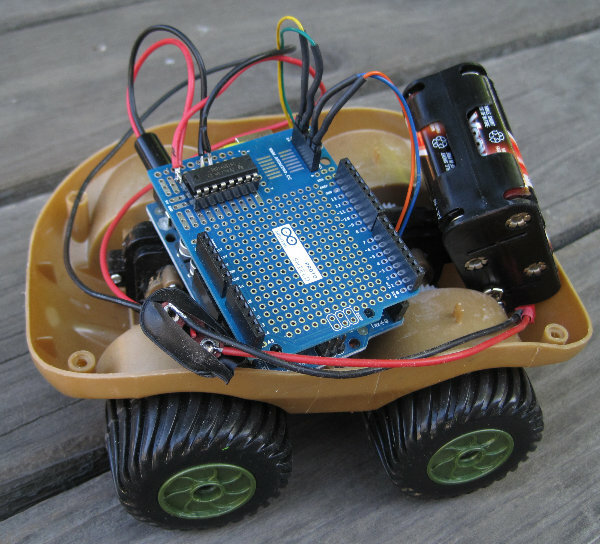 It's a fun project that every Arduino hacker should try at least once. But while there are lots of instructions on how to wire up a breadboard Arduino, most instructions on how to program one are confusing and incomplete. 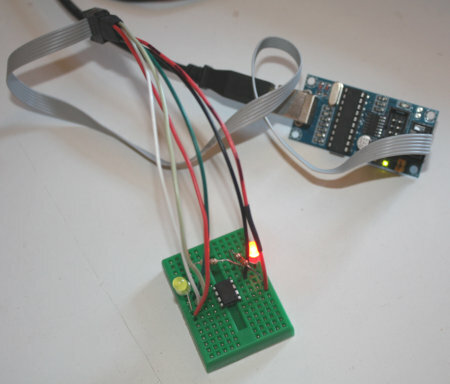 Of course, you can program your Atmega chip while it's in an Arduino, then unplug it from the Arduino's socket and move it to the breadboard. But what a hassle! It's so more convenient to leave the chip in the breadboard while you test new versions of the code. And you can, in two different ways: with FTDI, which uses the Arduino bootloader, or with an ISP, which doesn't. Either way, start by downloading a good pinout diagram for the Atmega328 chip. I use this one: the Arduino ATmega328 Pinout from HobbyTronics, which is very compact yet does a good job of including both the mappings to Arduino digital and analog pins and the functions like RX, TX, MOSI and MISO you'll need for programming the chip. An FTDI board is a little trickier to wire than an ISP, but it's less risky because it loads the code the same way an Arduino would, so you don't overwrite the bootloader and you can still put your chip back into an Arduino if things go wrong. So let's start with FTDI. 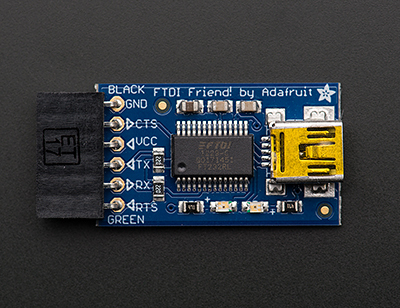 I use an Adafruit "FTDI Friend", but there are lots of similar FTDI boards from Sparkfun and other vendors. They have six outputs, but you'll need only five of those. Referring to your Atmega pinout, wire up power, ground, TX, and RX. For some FTDI boards you may need pullup resistors on the TX and RX lines; I didn't need them. Now you have four pins connected. Wiring the reset line is more complicated because it requires a 0.1μF capacitor. A lot of tutorials don't mention the capacitor, but it didn't work for me without one. 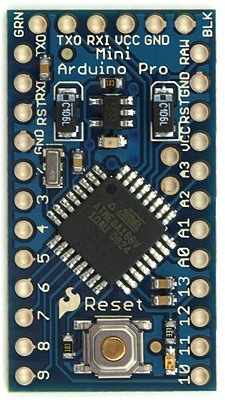 Connect from RTS on the FTDI board, through the 0.1μF cap, to the RST line. A 0.1μF capacitor is an electrolytic cap with a positive and a negative lead, but the few online tutorials that even mention the capacitor don't bother to say which side is whick. I connected the FTDI friend to the cap's negative lead, and the positive lead to the Atmega chip, and it worked. You may also need a pullup on that RST/RTS line: a resistor around 10kΩ from the RST pin 1 of the atmega chip to the 5v power line. Note: the Fritzing diagram here shows pullup resistors on RST, TX and RX. You may not need any of them. Incidentally, RST stands for "reset", while RTS stands for "Ready To Send"; they're not meant as anagrams of each other. The remaining pin on the FTDI friend, CTS, is "Clear To Send" and isn't needed for an Arduino. Once the wiring is ready, plug in the FTDI board, check to make sure Port is set to whatever port the FTDI board registered, and try uploading a program as if you were uploading to a normal Arduino Uno. And cross your fingers. If it doesn't work, try fiddling with pullups and capacitor values. You can use an Arduino as an ISP, but it's somewhat unreliable and prone to unexplained errors. A dedicated ISP isn't expensive, is easier to wire and is more likely to work. A common type of ISP is called a "USBtinyISP", and you can buy one from vendors like Sparkfun or Adafruit, or search for usbtinyisp on sites like ebay or aliexpress. Update: I've been curious about this flakiness: why does "Arduino as ISP" work fine for some people and utterly fail for others? One person I asked thought it had to do with the way Arduinos reset the RESET line whenever the serial port is opened: so RESET gets toggled at the wrong time as the bootloader code is being transferred. 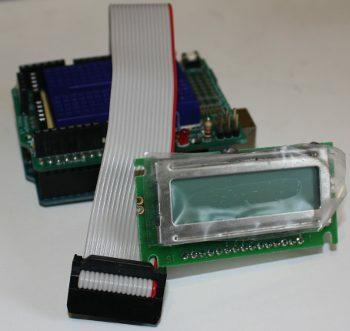 An alternate method that may get around this is Gammon Forum's Atmega bootloader programmer, which includes the bootloader bits as part of the code so it doesn't need to re-open the serial port. Someone else says a 10 uF capacitor between reset and ground should prevent that from happening; and another person says it should be a 100nF capacitor between RST on the programmer and RST on the AVR-chip plus a 10k pullup resistor, Most Arduino-as-ISP tutorials, including the official ones on arduino.cc, don't mention either capacitors or pullups, so that may explain why the method works for some people and not others. ISPs typically use a six-pin connector (2x3). It's not always easy to figure out which end is which, so use a multimeter in continuity mode to figure out which pin is ground. 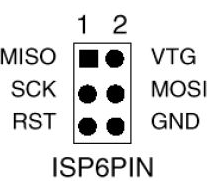 Once you're sure, mark your connector so you'll know which pin is pin 1 (MISO, the pin opposite ground). Once you have your ISP pins straight, refer to your handy-dandy Atmega328 pinout and connect power, ground, MOSI, MISO, SCK, and RST to the appropriate Atmega pins. Once you have your FTDI or ISP working, then you can think about making an even simpler circuit -- without the external clock and its associated capacitors. But there are a couple of additional tricks to that. Stay tuned for Part 2. 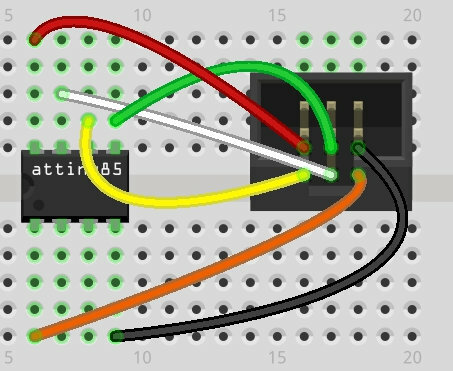 Having written a basic blink program in C for my ATtiny85 with a USBtinyISP (Part 1), I wanted to use it to control other types of hardware. That meant I wanted to be able to use Arduino libraries. Back in the main Arduino IDE, Tools->Boards should now havea couple of Attiny entries. Choose the one that corresponds to your ATTiny; then, under Processor, narrow it down further. In Tools->Programmer, choose the programmer you're using (for example, USBtinyISP). Now you should be able to Verify and Upload a blink sketch just like you would to a regular Arduino, subject to the pin limitations of the ATTiny. That worked for blink. But it didn't work when I started adding libraries. Since the command-line was what I really cared about, I moved on rather than worrying about libraries just yet. It assumes that if you're in a directory called blink, it should compile a file called blink.ino. It will also build any additional .cpp files it finds there. 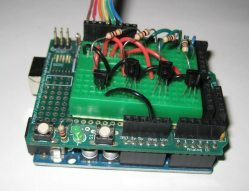 make upload uploads the code to a normal Arduino. But there are lots of different ATtiny cores, they're all different, and they each need a different set of specifiers like BOARD_TAG in the Makefile. Arduino-Makefile comes with an example, but it isn't very useful since it doesn't say where to get the cores that correspond with the various samples. I ended up filing a documentation bug and exchanging some back-and-forth with the maintainer of the package, Simon John, and here's what I learned. First: as I mentioned earlier, you should use the latest git version of Arduino-Makefile. The version in Debian is a little older and some things have changed; while the older version can be made to work with ATtiny, the recipes will be different from the ones here. Second, the recipes for each core will be different depending on which version of the Arduino software you're using. Simon says he sticks to version 1.0.5 when he uses ATtinys, because newer versions don't work as well. That may be smart (certainly he has a lot more experience than I do), but I'm always hesitant to rely on software that old, so I wanted to get things working with the latest Arduino, 1.8.5, if i could, so that's what the recipes here will reflect. Fourth, uploading sketches. As mentioned in the last article, I'm using a USBtinyISP. For that, I use ISP_PROG = usbtiny and sketches are uploaded by typing make ispload rather than the usual make upload. change that if you're usinga different programmer. With those preliminaries over: I ended up getting two different cores working, and there were two that didn't work. Install the cores in subdirectories in your ~/sketchbook/hardware directory. You can have multiple cores installed at once if you want to test different cores. Here are the recipes. git clone it into your sketchbook/hardware. Then either cp 'Prospective Boards.txt' boards.txt or create a new boards.txt and copy from 'Prospective Boards.txt' all the boards you're interested in (for instance, all the attiny85 definitions if attiny85 is the only attiny board you have). If your Arduino software is installed in /usr/share/arduino you can omit the first line. Now copy blink.ino -- of course, you'll have to change pin 13 to be something between 1 and 6 since that's how many pins an ATtiny has -- and try make and make ispload. There are plenty of other ATtiny cores around. Here are two that apparently worked once, but I couldn't get them working with the current version of the tools. I'll omit links to them to try to reduce the probability of search engines linking to them rather than to the more up-to-date cores. Damellis's attiny (you may see this referred to as HLT after the domain name, "Highlowtech"), on GitHub as damellis/attiny, was the first core I got working with Debian's older version of arduino-mk and Arduino 1.8.4. But when I upgraded to the latest Arduino-Makefile and Arduino 1.8.5, it no longer worked. Ironic since an older version of it was the one used in most of the tutorials I found for using ATtiny with the Arduino IDE. 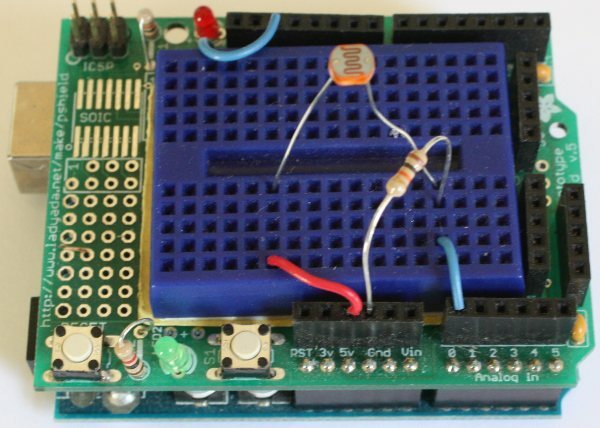 Simon says this core is buggy: in particular, there are problems with software PWM. I also tried rexxar-tc's arduino-tiny.core2 (also on GitHub). I couldn't get it to work with any of the Makefile or Arduino versions I tried, though it may have worked with Arduino 1.0. With two working cores, I can get an LED to blink. But libraries are the point of using the Arduino framework ... and as I tried to move beyond blink.ino, I found that not all Arduino libraries work with ATtiny. In particular, Wire, used for protocols like I2C to talk to all kinds of useful chips, doesn't work without substantial revisions. But that's a whole separate topic. Stay tuned. Arduinos are great for prototyping, but for a small, low-power, cheap and simple design, an ATtiny chip seems like just the ticket. For just a few dollars you can do most of what you could with an Arduino and use a lot of the same code, as long as you can make do with a little less memory and fewer pins. I've been wanting to try them, and recently I ordered a few ATtiny85 chips. There are quite a few ways to program them. You can buy programmers specifically intended for an ATtiny, but I already had a USBtinyISP, a chip used to program Arduino bootloaders, so that's what I'll discuss here. Then you need a Makefile. I started with the one linked from the electronut page above. Modify it if you're using a programmer other than a USBtinyISP. 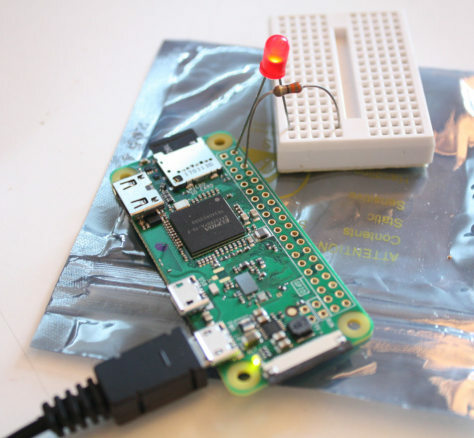 make builds the program, and make install loads it to the ATtiny. And, incredibly, my light started blinking, the first time! But wait -- not everything was rosy. I was calling _delay_ms(500), but it was waiting a lot longer than half a second between flashes. What was wrong? now my delays were proper milliseconds, as I'd specified. Here's my working attiny85 blink Makefile. To figure out what that means, go to the Fuse calculator, scroll down to Current settings and enter the three values you got from avrdude (E, H and L correspond to Extended, High and Low). Then scroll up to Feature configuration to see what the fuse settings correspond to. In my case it was Int. RC Osc. 8 Mhz; Start-up time PWRDWN/RESET; 6CK/14CK+ 64ms; [CKSEL=1011 SUT=10]; default value and Divide clock by 8 internally; [CKDIV8=0] was checked. Nobody seems to have written much about AVR/ATTINY programming in general. Symbols like PORTB and functions like _delay_ms() come from files in /usr/lib/avr/include/, at least on my Debian system. There's not much there, so if you want library functions to handle nontrivial hardware, you'll have to write them or find them somewhere else. Three I/O memory address locations are allocated for each port, one each for the Data Register - PORTx, Data Direction Register - DDRx, and the Port Input Pins - PINx. The Port Input Pins I/O location is read only, while the Data Register and the Data Direction Register are read/write. However, writing a logic one to a bit in the PINx Register, (comma sic) will result in a toggle in the corresponding Data Register. In addition, the Pull-up Disable - PUD bit in MCUCR disables the pull-up function for all pins in all ports when set. There's also some interesting information there about built-in pull-up resistors and how to activate or deactivate them. To read from pins, use PINB. In addition to basic functionality, all the pins have specialized uses, like timers, SPI, ADC and even temperature measurement (see the diagram above). The datasheet goes into more detail about how to get into some of those specialized modes. But a lot of those specialties are easier to deal with using libraries. And there are a lot more libraries available for the Arduino C++ environment than there are for a bare ATtiny using C. So the next step is to program the ATtiny using Arduino ... which deserves its own article. I found myself wanting to upload a sketch to an Arduino Pro Mini recently, using an FTDI Friend, and found that how to do it was surprisingly undocumented. First, the important thing is that the six FTDI pins do match up with the six pins at the edge of the Pro Mini, though obviously you have to figure out which way to rotate the two boards so you won't be 180 degrees off. I wasn't clear on that since the labels on the pins don't seem to match (see below). Second, if you haven't soldered headers to your Pro Mini, you can stick a female-female header into the FTDI Friend's female header. then insert the other side of the header into the holes in the Pro Mini at an angle -- hold them with some tension so that the header pins are making contact with the copper-plated rims of the Pro Mini holes. Okay, so the big question is which way to match the pins. It's complicated by the Pro Mini's having both outer holes unlabeled. Usually when trying to match pins I start by looking for Ground, and make sure the two Grounds match. That doesn't work here -- the FTDI has the Gnd on one of the outer pins, while the Pro Mini has Gnd on the second pin in. The pin parked Gnd on the Pro Mini goes to CTS on the FTDI, while the pin parked Gnd on the FTDI corresponds to a pin on the Pro Mini that's unmarked. If you turned one of them 180 degrees, then you'd have Gnd (Pro Mini) - Rx (FTDI), and Gnd (FTDI) - unmarked (Pro Mini). No help there. So ignore Ground and use VCC as your guide. It's on the third pin in -- so only in one orientation will VCC on both boards match. That's the orientation you want, and it works. On some Pro Minis and some FTDI boards, you'll also have a label for "GREEN" or "GRN" on one side, and "BLACK" or "BLK" on the other. Match those if you have them, but you may not find that on all boards, particularly if you ever hook up to clone or third-party boards. So stick to VCC as a guide and you should be okay. So what are those outer two holes on the Pro Mini? An image search for Arduino Pro Mini Pinout gives some pages showing GRN as TX and BLK as +9V (I assume that would be Vin, but actually those pages seem to be referring to the Arduino Mini, not the Pro Mini). But another shows GRN as RESET and BLK as Gnd. 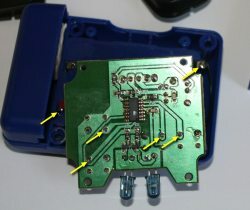 The official Pro Mini schematic shows the outer pins on JP1 as DTR and GND. So that seems most likely. 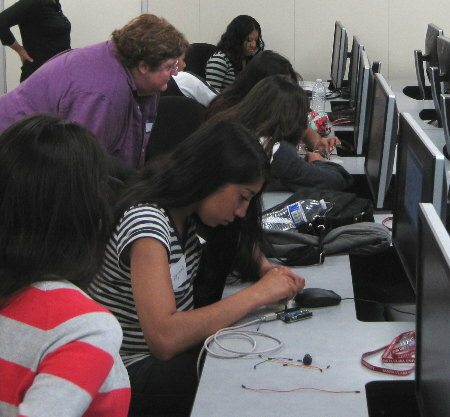 Last summer I led a one day robotics workshop for high school girls as part of the Society of Women Engineers' GetSET summer camp. I'm giving it again this year, on June 26. 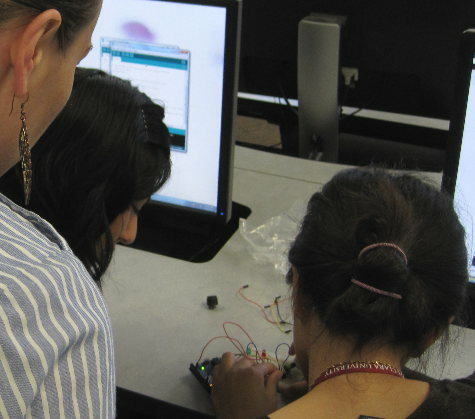 We're still lining up volunteers to help teach the workshop, and I'd love help from bay area women -- you don't have to be a robotics or programming expert, just willing to learn and play. The workshop is based around the Arduino open-source microcontroller: we hook up Arduinos, then wire up LEDs, buzzers and other parts on breadboards and make them do things. It's a programming workshop as well as a hardware one: most of the girls had a workshop the previous summer on Ruby programming, but that's their only exposure to programming. So it's a challenge to see how much we can cover in one day -- and a testament to the girls that they do so well. Last year we spent the morning covering wiring Arduinos to the basics like breadboards, LEDs, pushbuttons and potentiometers. Then in the afternoon, teams worked on projects -- some of them wired together lots of colored LEDs, some worked with making sounds with buzzers, and one team built a robotic truck. I was hoping to be able to show them more motorized projects, and I'd brought several toy cars and trucks scavenged from thrift shops (radio controlled toys that had lost their radio controller). But the wiring needed for the H-bridge to control the motor is complex, and the team that chose the truck project had their hands full getting the truck running by the end of the day -- forget about adding any bells and whistles. I wanted to make that easier. So for this year, with a little more time to prepare, I'm wiring up some Arduino motor shields. Shields are devices that stack on top of an Arduino. You can do all the difficult wiring beforehand, and just plug in the shield when you're ready to use it. The down side is that shields can be expensive -- motor shields typically cost around $25. That's okay if you're buying one, but if you're trying to outfit a classroom, that can add up pretty quickly. But I found a way of building motor shields cheaply. The H-bridge chip I'm using, the SN754410, is $1.75 at Jameco if you buy 5 or more. 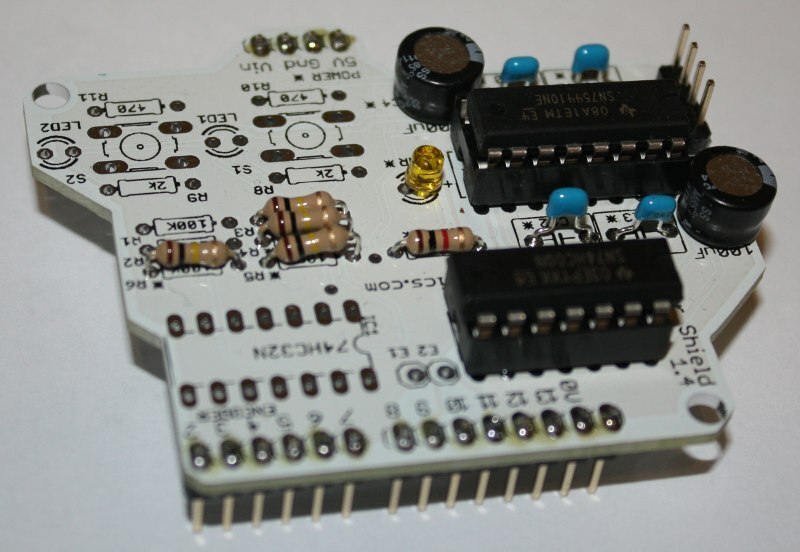 Jameco also carries a proto-shield PC board ($4.25 in quantity) and stacking headers ($1.59). So that's only $7.59 per shield, plus shipping, not counting a few sundries like battery connectors that I'd already bought for last year's class. Then I had to wire up the shields. I was all fired up about having a good excuse to use wire-wrap instead of soldering. But then I realized that tiny 30-gauge wire-wrap wire probably wasn't adequate for the current going to the motors. So I soldered wires for the motors, the power lines from the battery connector to the H-bridge chip, and from the battery connector to the Arduino's Vin. Then I wire-wrapped everything else. The end result looks nice and clean from the top (please avert your eyes from my messy soldering underneath). There's no scary rats-nest of wires, like with the breadboards I used last year, and there's plenty of empty space on the board to velcro a battery or attach sensors like an ultrasonic rangefinder. I think this will work well and will encourage the girls to get some little cars zipping around the computer room. I'm looking forward to setting up some simple projects I can combine with the cars -- light sensors, sonar or IR rangefinders, other ideas? I'd love suggestions from anybody, and I'd especially love to line up some volunteers (women only for the day of the workshop, please). 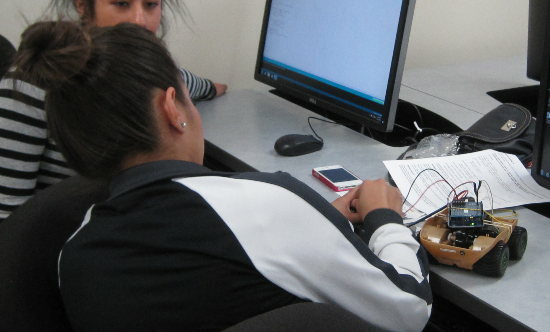 Workshop day -- June 26 -- mostly means walking around checking on how the girls are doing, cheering them on, helping them debug problems by checking their wiring and looking over their programs (very simple code -- remember, they've never seen C code before). And if anybody (male or female) wants to get together before the workshop and play with Arduinos, help me solder the rest of the shields, and brainstorm fun projects for the girls, please drop me a line! The rough outline, handouts and wiring diagrams so far are at my Robots and Sensors Workshop page. I've done a few experiments with playing music on an Arduino over the years -- the Arduino library has a tone() call that gives you a nice tinny monophonic "chiptunes" style noise. But for playing anything more complex, you need more processing power. I had a silly little project in mind. I like some pink noise when I'm sleeping (in summer, I usually have a fan running). You can buy electronic devices called "sleep soothers" that have tracks of the ocean, rain, trains etc. but they often have annoying misfeatures (like foghorns or train whistles in the middle of a track). Wouldn't it be more fun to make my own, with sound samples of my choice? Of course, I needed some sound samples, and I found a great resource: Laptop.org's list of Free sound samples. I downloaded a few sample collections that looked like they might have some nice ambient pink-noise sounds -- rain, ocean and so forth. 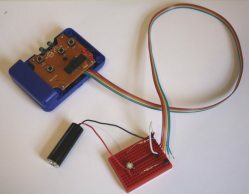 There are several Arduino shields for playing sound files. The simplest (and probably cheapest) is the Adafruit Wave Shield, and that's what I started with. It comes as a kit that you solder together (an easy soldering project) and it has its own volume control and SD card reader. On the down side, it can only play .WAV files, not other formats like .MP3 or .OGG. But for my sleep soother project that was okay. 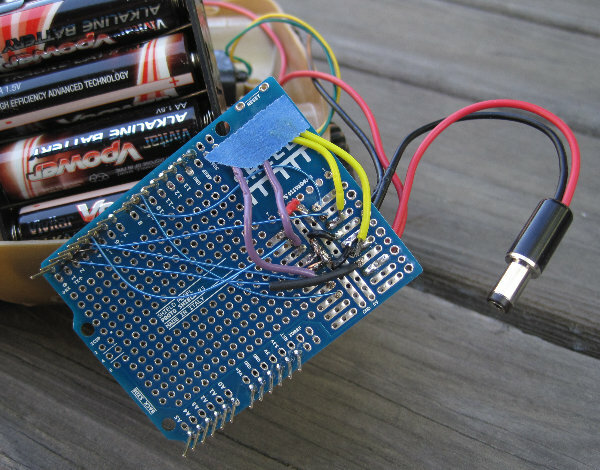 Getting basic sounds playing was easy, following Adafruit's tutorial and sample code. But for my project, I also needed some external buttons, to allow for jumping from one track to the next. I was a little confused about which pins are used by the shield, and I ended up wiring my button to one of the pins that the shield uses for talking to the SD card reader. Things didn't work at all. And then while I was fumbling with plugging/unplugging things, at some point I installed the shield onto the Arduino wrong, with the pins off by one. I'm not sure whether it was the miswired button or the off-by-one shield, but something got fried in the wave shield and it was never able to read an SD card again after that (yes, even after plugging it in properly). I thought about ordering another Wave Shield. But I was leery -- if it's so delicate that a stray 5v signal in the wrong place can fry it permanently, how long did I expect a second one to last? Besides, I was tired of soldering things, and I happened to be putting in an Amazon order for some other things. So I ran a search and found that there was an MP3 player shield available through them, made by Seeed Studio. It even had buttons built in, so I wouldn't need any extra hardware. It was a little more expensive than the Wave shield, but it claimed to play MP3 and OGG as well as WAV, and it comes pre-assembled, no soldering needed. The hardware arrived and looked nice. Two simple buttons plus a "multifunction" button you can press or rock left or right. I grabbed a micro SD card, put some MP3s on it, and went to Seeed's page on the Music Shield. I was a little worried when I discovered that they have three different demos there -- each of which comes with a different library, and you have to remove one set of libraries before you can try a different demo. Not a good sign. And indeed, it wasn't. None of the demos worked at all. When I added some debug Serial.printlns, I found that it wasn't opening the SD card. Much web searching found a couple of people saying they'd discovered that the Seeed shield only works with 2G or smaller microSD cards. Good luck finding one of those! The next day, I drove all over town looking for one, without success, and was on the verge of giving up when Dave remembered a little cheapie camera he'd bought a few years ago for taking airplane movies. It came with a microSD card. Success! It was a 2G card. Back to trying the various demos and their incompatible libraries again. And this time, one of the demos, the first one (the one that comes with the Music v1 14.zip library), worked. I could play tracks, sequentially as they were loaded on the SD card. Unfortunately, that wasn't what I wanted to do -- I wanted to play the same track over and over, jumping to the next track when the user presses a button. I tried the other demos. None of them worked at all. Long story short, after struggling for the better part of a week and reverse-engineering a fair amount of the Music v1 14 library, I finally got my sketch working. I come from the open-source world. I keep my Arduino sketches on GitHub (at least once they work well enough to be useful to anybody). So of course I wanted to share the work I'd put into fixing this library. Copyright (c) 2010 Seedstudio. All right reserved. Pffft! So after finally getting things working, I can't share my working version of the library! What are they thinking? What on earth is the point of distributing a library for your hardware, one that you know doesn't work very well (or you wouldn't be distributing four different incompatible versions of it), and then not letting anyone fix it for you? I posted a query in one of the many threads discussing problems with the Music Shield, asking if Seeed would consider releasing the library under a license that allowed redistribution. It's been a few weeks now, and no answer yet. Incidentally, even posting the query wasn't easy. Seeed doesn't let you post in their forums unless you register -- and the registration process requires full name, address, and phone number! Fortunately, they have no way of knowing whether the info you give them is fake, so that's what I did. Since I don't have permission to share the code directly, I've checked in a patch that updates their library so it can play arbitrary tracks, not just sequential ones, and can re-play the same track. It's here: Music Shield library on GitHub, along with my sample app, called play-repeat. So my app is working now. Well, mostly; sometimes the volume randomly jumps in the middle of the night, which I think is a hardware glitch, but since it only happens after several hours of play, it's hard to debug. But if you're looking for an Arduino sound project, I can't recommend either the Wave Shield or the Seeed Music Shield. The Wave Shield seems too fragile and its formats are limited, though the tutorials and support are great. And I'll certainly never buy anything from Seeed again. If I had it to do over again, I'd spend the big bucks and buy the Sparkfun MP3 Player Shield. It's more expensive ($40) and doesn't have nice buttons like the Seeed shield, but it plays all the formats the Seeed shield does, and they offer tons of documentation and examples, including an open-source library and code contributed by users. I got a request from SVLUG to fill in at the last minute for a speaker with a health emergency. Fortunately, I'd been slated to give them my Arduino talk from SCALE in a few months, so I was happy to accept. 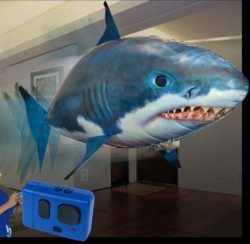 I'm always glad for a chance to show off Bruce, my Arduino- and Linux-controlled 6-foot flying robotic shark. And if anyone reading this happens to be in town for PyCon, Symantec isn't that far from Santa Clara, roughly a 10-minute drive ... and I promise there will be at least two interesting Python scripts presented. It's free, of course, so come hear the talk! Here are the SVLUG meeting details and directions. Working on projects that might be fun for a proposed Arduino high school workshop, I realized I hadn't done much with Arduinos and sound. I'd made clicking noise for my sonar echolocation device, but nothing more than that. 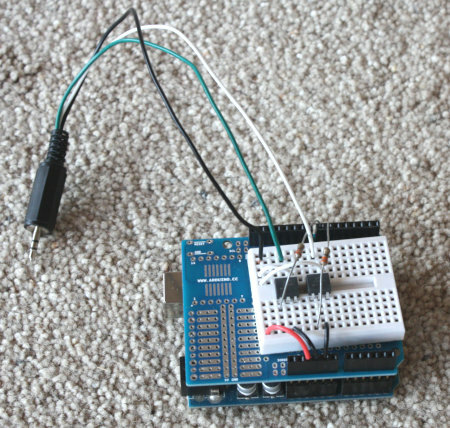 But the Arduino library has a nice function to control a speaker: tone(int pin, int frequency, int length). tone() works much better than trying to make your own square wave, because it uses interrupts and doesn't glitch when the processor gets busy doing other things. You can leave off the length parameter and the tone will continue until you tell it to stop or change frequency. // Random frequency between 20 and 1400 (Hz). Purely random tones aren't very interesting to listen to, though, as it turns out. How about taking input from a photo-resistor, to make a light theremin that wails as I move my hand up and down above the sensor? The photoresistor I was using typically reads, on the Arduino, between 110 (with my hand over the sensor) and 800. So I wanted to map that range to audible frequencies the speaker could handle, between about 20 Hz and 5000. // Set the frequency according to the light value read off analog pin 0. That was fun, but I still wanted to try some random music that actually sounded ... musical. So how about programming the standard scale, and choosing frequencies from that list? Multiplying the frequency by 2 transposes a note up one octave; dividing by two, down one octave. cur_octave will keep track of that. Now if whichnote is a number from 0 to 7, cur_octave * just[whichnote] * middle_c will give the next frequency to play. Just choosing notes from this list wasn't all that interesting either. So I adjusted the code to make it more likely to choose a note just one step up or down from the current note, so you'd get more runs. It's still not great music, but it's a fun experiment and I'm looking forward to adding more rules and seeing how the music improves. But this left me hungry for real music. What if I wanted to play a real piece of music? Certainly I wouldn't want to type in an array of frequency numbers, or even fractions. I'd like to be able to say A, Ab (for A-flat), Cs (for C-sharp), etc. It's a bit tedious to type in the notes one by one like that, which is why I stopped when I did. And as far as I know, the Arduino can only emit one tone at once -- to play the real 2-part invention, you either need a second Arduino, or extra hardware like a wave shield. Anyway, it was a fun series of experiments, even if none of it produces great music. You can see the source at github: akkana/arduino/music. with several different device numbers each time, and an occasional unable to enumerate USB device on port 4 thrown in. What was wrong with the cable? I did some testing with a multimeter versus a pinout diagram. Didn't get a definitive answer, but I did find that on the cable that doesn't work for the Nano, it was hard to get a solid connection on the D- (#2) pin inside the Type A connector. But since that's the connector that goes to the computer end (in my case, a powered hub), if it wasn't making good contact, I would expect it to show up everywhere, not just with the Nano. Maybe the Nano is more sensitive to a good solid D- connection than other devices. I'm not really convinced. But Arduino's Troubleshooting Guide suggests: "Try a different USB cable; sometimes they don't work." So I guess they don't know what's special about some cables either. So if your Arduino Nano doesn't initially connect properly, don't panic. Try a few different cables (everybody has about a zillion mini-USB cables lying around, right? If not, here, have five of mine). The Nano is happily composing random chiptunes as I write this. I've wanted an Ardweeny for a long time. It's just so cute -- it's an Arduino compatible that's barely bigger than the Atmega 328 chip driving it. Plus, it's cheap: $10 including the chip. 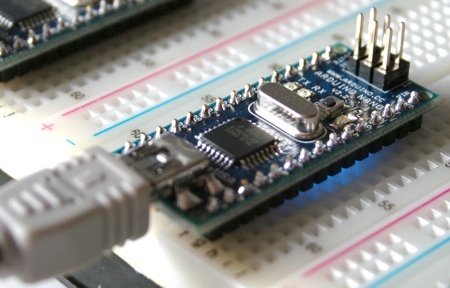 Like most small or low-cost Arduino clones, the Ardweeny doesn't have its own USB connection; instead, you use an adaptor such as an FTDI Friend, which slides onto a 6-pin header on the Ardweeny. I knew that ahead of time. One thing I hadn't realized was that the Ardweeny gets its only power from the USB adaptor. So if you want to use an Ardweeny by itself with no computer connection, you need a regulated 5v power supply. Those are easy enough to build (see the Breadboard Arduino), but don't forget to allow for that when designing projects. 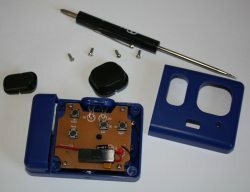 The Ardweeny comes as a kit that needs soldering -- something that isn't made clear in the sales literature, though for the price, it didn't surprise me. I downloaded the Ardweeny soldering steps (PDF) and got to work. The PDF estimates 15 minutes for the construction. The first part, soldering the 10 components, was a snap, and took maybe 10 minutes. At this point you can take the Ardweeny and nestle it down over the Atmega chip, and test it to check your soldering work. I plugged in my FTDI Friend and the LED immediately started blinking. Success! (It's nice of them to pre-program the chip with blink code, so it's easy to tell it's working.) Downloading my own version of the blink sketch (use the Duemilanove w/Atmega 238 setting, or atmega328 if you use my Makefile) also worked fine. Except that I wasn't done. The next step of the build is to solder all 28 legs of the Ardweeny directly to the Atmega chip's legs. Scary idea -- won't all that heat kill the chip? But the instructions didn't have any warnings about that. I took a deep breath and forged ahead. This part put me way over the 15-minute estimate -- 28 pins is a lot of pins, and I took it slowly, careful to be sparing with heat and solder. When I was finally done, I plugged the FTDI Friend back in and ... nothing. Not a blink. And when I checked voltage on one of the V+ pins versus the ground pin, it measured around 1.5v, not the 5v I expected to see. So I'd messed something up. Somehow, even though it worked without soldering the legs, that additional soldering had broken it. I went through all the pins with a voltmeter checking for shorts, and tested everything I could. Nothing obviously wrong. It might have been nice to inspect my solder joints on the Ardweeny -- but once the Ardweeny is soldered to the chip, the solder is all inside and you can't see it. But anyway, I'd tested it and it had worked fine. So I figured I must have destroyed the chip with heat or static during that soldering process. My Ardweeny was a brick. Nothing salvageable at all. Unless -- if I could somehow de-solder the legs and pull the two apart, I could use the Ardweeny with another chip. But how do you de-solder 28 legs? I tried a solder sucker (a pen-shaped vacuum pump) and de-soldering braid, but neither one broke the bond between the two sets of legs. I tried sliding an X-acto knife in between the Ardweeny's legs and the chip's while heating the leg with solder; no luck, the knife blade was too good a heat sink and the solder never melted. Dave finally found a solution. With my assurance that the chip was probably dead anyway, he rolled the Ardweeny on its back, and used the tip of the heated soldering iron to bend each chip leg inward away from the Ardweeny leg. When he was done, the chip looked bent and sad, like a squashed millipede -- but the pieces were separated. And now I could take the Ardweeny and stick it on an Atmega 328 I pulled out of another Arduino. Plugged in the FTDI Friend and -- nothing. Wait, it was the backpack that was bad? But I tested it before doing that last soldering phase! I took the sad squashed-millipede Atmega and carefully bent all the pins back into shape, or at least close enough that I could plug it into a socket in my Diecimila. And, amazingly -- that poor abused overheated squashed bent 328 still worked just fine. Okay, so the problem is definitely in the Ardweeny backpack. Now that the solder joints were exposed again, I examined them all and found two that looked questionable. I re-soldered them -- and everything worked. I still don't know why my board worked the first time, then failed after the step of soldering the legs. But it makes me nervous about repeating that leg-soldering step. What if something else, something that's working now, stops working? For now, I'll probably solder just a few pins -- maybe the four outermost ones -- and rely on pressure for the other contacts. Of course, in a real environment where the Ardweeny might be subject to vibration and temperature changes, that might not be good enough. But until then, it seems the safest option. When SCALE approved my talk proposal, Fun with Linux and Devices, I had a challenge: I needed some good, visual Arduino demos that would work in front of an audience. In particular, I wanted something that moved. A little toy truck? A moving penguin? A rotating sunflower? I fiddled with this and that, not fully satisfied with anything. And then suddenly I realized what I needed. Something cool. Something BIG. Something I'd been wanting an excuse to buy anyway. I'd seen these things on video, but never in person. They're available all over, even on Amazon, so I put in an order there and got a shark in a few days. These things are ridiculous and cool. It's huge, about 5 feet long, and filled with helium. It takes maybe half an hour to assemble. It has a small motor to beat the tail, an infrared transmitter, and a weighted receiver that moves back and forth on a track to tilt the fish up or down as it swims. Once it's assembled, you can get it filled with helium at a party store (which costs $3 to $6 depending on where you go). Once the shark is filled, you add clay as ballast until the shark is neutrally buoyant, neither rising nor sinking. It's quite sensitive: you'll find yourself needing to add or remove pea-sized chunks of clay as the temperature in the room changes, but being a little over- or under-ballasted doesn't hurt it much. With its tail beating, the shark really does look like it's swimming through the air. My shark is named Bruce, after the mechanical shark used for the movie "Jaws". My Bruce, I'm happy to say, has been much more tractable than his famously intemperate namesake. Okay, now how do we turn this ridiculous-but-cool thing into an Arduino project? There were two possible approaches. First, mount an Arduino directly on the shark, and let it be totally self-directed. 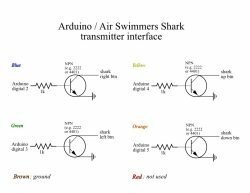 Second, patch the Arduino into the shark's transmitter and control it from Linux. I chose the second option, for several reasons. First, I was fairly sure it would be easier, and less invasive (the shark would still be usable with manual control). I also liked the idea of keeping the transmitter as a manual override, in case my control program didn't work right. Finally, I liked the idea of keeping a Linux machine in the loop -- the shark would actually be controlled by Linux, not just by the Arduino. So the first thing I did was take the transmitter apart (4 Philips screws). Inside are 4 pushbuttons, for right, left, up, and down, and the circuit board is nice and simple. Whew -- this might be doable! Four more screws and I had access to the back of the board, which was equally simple. Now I could get my voltmeter on the contacts while I pushed buttons. It turned out the contacts (indicated with arrows on the photo) on the downstream side of each switch were normally high (4.5 volts -- the transmitter uses 3 AAA batteries). When I pushed the button, the contact went to ground. Okay, so what I needed was some way for the Arduino to ground those contacts at will. I figured I needed 6 wires: ground, power, and one for each switch. (It turned out I didn't need the power wire, but I figured it didn't hurt to include it just in case.) I wanted to have a nice small connector on the side of the transmitter, but I couldn't find any 6-pin connectors that didn't look big and bulky, so I gave up and decided I'd just let my ribbon cable dangle from the transmitter. If I got a nice multi-colored one, maybe it would look festive. I couldn't find any 6-conductor ribbon cable, so I got a wider one and separated 6 wires from the rest. Then I soldered the six wires to the appropriate places (marked by arrows in the photo). On the other end, I tinned the six wires with solder so I could plug the stranded wires into my breadboard. I've done enough reading to know of three ways to simulate a button press. You can put a relay between the two contacts of the switch; you can do the same thing, but with an optocoupler (opto-isolator) instead of a relay; or you can do some magic with a transistor. I was fuzzy on the transistor magic bit, so a relay sounded easiest. I played around with a relay and a spare switch and convinced myself I knew how to wire them up. Then it was off to my local parts store to buy four matched relays small enough to fit on my little mini breadboard. There followed a several-day fiasco wherein I bought lots of relays that turned out not to be suitable, and got increasingly frustrated at how large and clunky all the available relays were. There are smaller ones, but I couldn't get them to work. And I learned that relays mostly come without documentation on which pin does which, so there's a lot of experimenting with each new type. Frustrated, I tried some optocouplers I'd bought on a whim last year. No dice ... couldn't get them to work either. It took me some experimenting with a transistor, an LED and a couple of resistors (I blew out a couple of transistors before I realized I had the R2 resistor in the wrong place) but eventually I got it working, and felt confident enough to try it with the real shark transmitter. The key was to simplify the circuit so it had no extra parts, then once it was working, add more parts to build it up to what I needed. At left, the circuit I ended up with. For each button, I have one transistor and one resistor (I don't need the second resistor from the LED4dummies circuit, since that was just to keep the LED from burning out). At right is the circuit assembled on a mini-breadboard on top of the proto-shield. Note that the ends of the ribbon cable are plugged in to a spare header I had lying around; a header makes a passable connector, so I can plug it in fairly easily right before a talk. The green and blue wires in the back are going to Arduino digital output pins 3 through 6 (leaving 0 and 1 for serial I/O). The red wires go from the transistors back to the ribbon cable wires that go to the shark's transmitter buttons. Now I could make the shark think I'd pressed a button on its transmitter. How do I control that from Linux? On the Arduino side, I wrote a simple program that reads and parses commands coming over the USB cable. So from the computer, I might send a line like L 300, and the Arduino would "press" the Left button for 300 milliseconds. I had already written something like this for a couple of other Arduino programs. That program is shark.pde. On the Linux side, first I needed something that established a serial connection and sent commands to the Arduino. I wrote a Python class for that, shark.py. That let me send commands from the Python console to test the shark. Then I needed something more visual, something I could show during a talk. In particular, the shark doesn't swim unless someone's pressing left, right, left, right buttons over and over. Of course I wanted the computer to handle that part. So I wrote a little Python-GTK application that keeps the shark swimming, and lets me drag a mouse around to adjust its left/right up/down direction: sharkwindow. Purely by coincidence, the week before SCALE, Scott Adams introduced a roboshark character: Dilbert, Jan 11 2012. Nice timing for the debut of my own roboshark! Sadly, I don't have any photos or video of the shark in action. But if you're a LWN subscriber, there's an article on my talk with a couple of great pictures: Robots rampage (in a friendly way) at SCALE 10X. And you can see my slides and notes at Arduino notes. Yesterday Dave and I attended a "Robot Hackathon" in Redwood City, part of a "nerd new year" 11/11/11 celebration. What a fun event! O'Reilly/Make generously sponsored hardware, so everybody got an Arduino Uno as well as a Grid Kit, a couple of sheets of cardboard pre-scored in a grid to encourage cutting and bending into various robot shapes, and a couple of motors. Tools were provided -- there were big bins of wire, soldering irons, glue guns, box cutters and other odds and ends. People of all ages were there having fun -- lots of kids there with their parents, as well as adults of all ages and experience levels. The adults were mostly fiddling with the Arduinos; the younger kids mostly eschewed the electronics and concentrated on building cool monsters and vehicles with the cardboard kits. I saw some great models -- penguins, squid, tanks, cherrypickers, many-legged bugs. Wish I'd thought to take a camera along. No instructions were provided, but I didn't see many people looking lost; there were enough people there with experience in Arduino, soldering and the other tools who were happy to help others. I was able to help some folks with their Arduino projects while I worked on copying a grid penguin model from a nearby table. There were lots of friendly volunteers (I think they were from Robotics for Fun) wandering around offering advice, in between building a cardboard city out of GridKits. There was even pizza, from host Pizza & Pipes. I had to leave before finishing my penguin, but it does have me inspired to do more with Arduinos and motors. I had a blast, both fiddling with my own projects and helping other people get started with Arduinos, and I'm pretty sure everybody else in the room was having an equally good time. Thanks, sponsors O'Reilly/Make, Robotics for Fun, The Grid Kit, Mozilla, MS and Andreessen Horowitz! 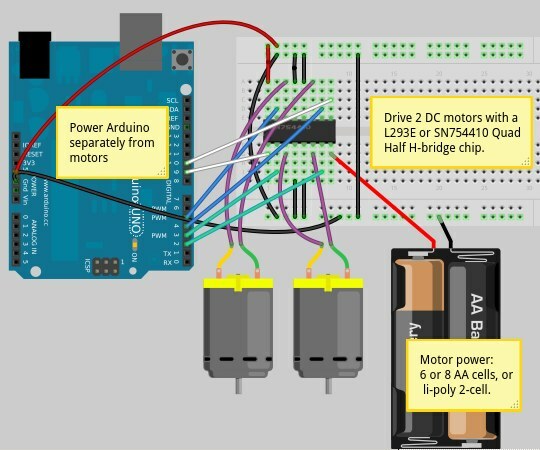 One point of confusion: everybody got their Arduino LEDs blinking quickly, but then how do you control a motor? I wasn't sure about that either, but one of the volunteers found a printout of sample code, and it turned out to be simplicity itself: just plug in to one of the digital outputs, and set it to HIGH when you want the motor to spin. There was much discussion at my table over how to reverse a motor. I suggested you could plug the two motor leads into two digital pins, then set one HIGH and the other LOW; then to reverse the motor, just swap the HIGH and LOW pin. Nobody believed me, and there were a lot of fervent assertions that there was some magic difference between a pin being LOW and a real ground. I should have coded it up then to demonstrate ... I wish I had, rather than spending so much time hot-gluing penguin parts. Now that I'm home and it's too late, here's an example of how to reverse a motor by plugging in to two digital outputs. // Alternate between two directions and motionless. // Assume we start with both pins low, motor motionless. Incidentally, powering robot motors directly from an Arduino is generally a bad idea. 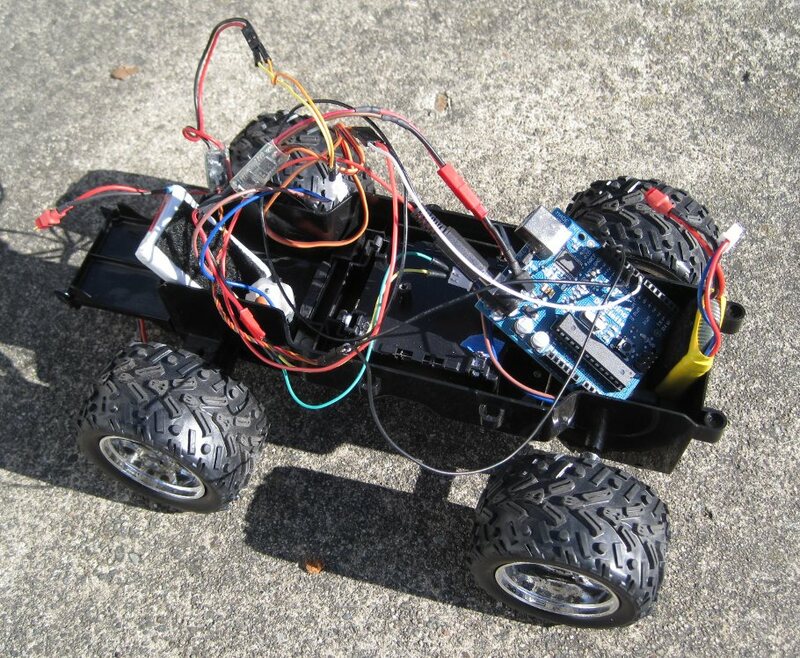 It's okay for testing or for small servos, but if you're going to be driving a truck with the motors or otherwise pulling a lot of current, it's better to use a separate power supply for the motors rather than trying to power them from the Arduino. The easy way is to buy something like this Motor/Stepper/Servo Shield that plugs in to the top of your Arduino and has its own power supply. As I've written before, I prefer to do my Arduino hacking from the command line ... but I didn't know the settings needed for an Uno, and avrdude is quite particular about settings and can't auto-configure anything. So I ended up using the standard Arduino IDE while I was at the event ... there was theoretically wifi at the site, but it wasn't working for me so I had to wait 'til I got home to search for solutions. Now I've uploaded a new, more flexible version of my Arduino Makefile with presets for the Uno, Duemilanove and Diecimila models: Makefile-0022-v3. Debugging Arduino sensors can sometimes be tricky. While working on my Arduino sonar project, I found myself wanting to know what values the Arduino was reading from its analog port. That's all straightforward -- but then you need something that reads it on the PC side. But I found that a bit fiddly for various reasons. And I discovered that it's easy to write something like this in Python, using the serial module. That worked great for debugging purposes. But I had another project (which I will write up separately) where I needed to be able to send commands to the Arduino as well as reading output it printed. How do you do both at once? With the select module, you can monitor several file descriptors at once. 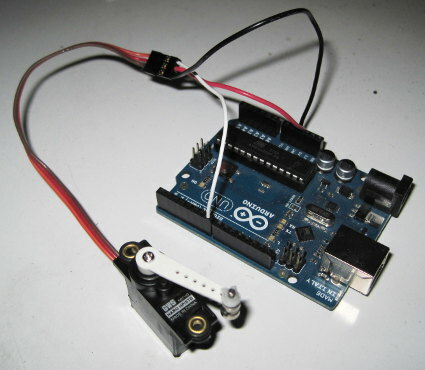 If the user has typed something, send it over the serial line to the Arduino; if the Arduino has printed something, read it and display it for the user to see. Add in a loop to find the right serial port (the Arduino doesn't always show up on /dev/ttyUSB0) and a little error and exception handling, and I had a useful script that met all my Arduino communication needs: ardmonitor. Every now and then I think it might be handy to have some sort of display on the Arduino ... something a little more detailed than an LED that either blinks or doesn't. Adafruit's 2-line LCD text display comes with a great Character LCD tutorial, but it's quite heavy, and includes a backlight I don't need. I wanted something more minimal. Alas, googling produced no useful information for any of those numbers. Foiled again! It might as well have been unlabeled! Wait -- let's not give up quite so quickly. Adafruit's LCD Shield tutorial says most parallel displays have either 14 or 16 pins, while this one has 15. That's close, at least ... but comparing the two Ada tutorials, I could see that the pin assignments for the two displays were completely different even though both were 16-pin. I wasn't going to get pin assignments there. Searching for just densitron 15-pin lcd found lots of displays that clearly weren't this one. But apparently a lot of them were similar to a display called an LM50. Perhaps mine used that pinout too. in the Liquid Crystal Arduino sketch. Works great! I went back and grabbed another $3 display. So the moral is, even a complete hardware klutz shouldn't give up too easily: with the right web search terms and a little fiddling, you might just get it to work after all. Update: apparently something has changed in the LiquidCrystal library, and you now need a trick to get this to work. Specifically, to see the rightmost 8 characters, you need to call lcd.setCursor(40, 0). See this discussion: 16x1 LCD showing only first 8 characters (lcd.setCursor(0,1) not working). I've been doing more Arduino development lately. But I don't use the Arduino Java development environment -- programming is so much easier when you have a real editor, like emacs or vim, and key bindings to speed everything up. The highlight of Thursday morning was a filler: one of the speakers had to cancel, so Paul Fenwick filled in with a combination of two short talks: "The Art of Klingon Programming" and "What's new in Perl 5.10?" I'm not a Perl programmer (at least not when I have a choice) but his talks were entertaining and even educational. What struck me most was that showmanship and humor don't have to detract from technical content. I'd had a discussion the previous day about the balance of offering lots of technical content versus entertaining the audience and not overwhelming them. Most technical talks are either dry, content heavy and so jam packed with information that you can't possibly remember everything, or lighter weight and glitzy but with not much real technical content and a "watered down" feeling. Paul's Klingon talk was one of the most content-full presentations I've seen at a conference, with lots of code examples, yet it kept the audence laughing, listening and grokking (to mix SF metaphors) all the way through. Showmanship can make it easier, not harder, to remember technical content. Partway through, I skipped out to go check Donna Benjamin's "The Joy of Inkscape." It had been moved from its original lecture hall to a much smaller room with tables. The smaller room was Standing Room Only, a raucous and enthusiastic bunch who (the sitting ones, at least) were nearly all tapping away on laptops exploring either the demo Donna was showing or other Inkscape projects. It was clearly a hugely successful and fun tutorial and I wanted to stay, but I couldn't find a place to sit where I could both see the screen and hear Donna, so I made my way back to Arduino. The second half, when they demoed various interesting sensors and a few unusual Arduino applications, was better than the first. But talking to folks later, a number of us were surprised because we expected a more interactive tutorial (the prep had encouraged us to bring or buy Arduino hardware). The hot talk of the day was one I missed, after the tea break. I went to a talk on Spring, a robotics library (Clinton Roy), which was interesting enough and certainly popular (lots of people sitting by the door because all the seats were full) but afterward all I heard was people enthusing about Jeff Arnold's amazing Ksplice talk. He demonstrated a system of updating kernels in place, with no reboot required. People couldn't say enough about the talk, and I'm looking forward to downloading the video and seeing what I missed.